This method was developed by Joseph Pilates and follows principles, both philosophical and theoretical, that he refined over a period of 60 years. Classes taught in this style include his original exercises and concepts. The many benefits of Classic Pilates include longer, leaner muscles, improved posture & balance, increased core strength & stability, and muscular strength & flexibility. IM=X stands for Integrated Movement Exercise; it was developed as a bridge between fitness training and the Classic Pilates Method. Benefits of this method include a combination of the stability, muscular lengthening, and flexibility of Pilates with the added elements of strength and cardiovascular training. This class is a perfect method of exercise for those coming back from an illness or injury. 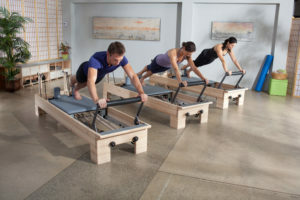 In addition to all of the other benefits of Reformer, this class focuses on correcting muscle imbalances, increasing flexibility and deepening the connection to the breath. This is a specialized class that adds an interval training component for increased cardiovascular benefits. Reform your body and the way you move! 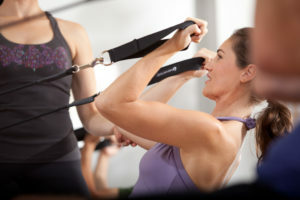 The Pilates Method is a unique and extremely effective exercise system that is appropriate for all fitness levels. It creates longer, leaner, and stronger muscles, with an emphasis on core strength, flexibility, and controlled movement. Did you know that Joseph Pilates used his exercise system to rehabilitate soldiers during World War 1?